The Marriage Saver was one of our first products and continues to be one of the best sellers. Reversing cameras are a great aid to help you reverse but they will not stop you hitting your rear bumper. The Couplemate® Caravan Reversing Guide (Marriage Saver®) makes hitching up your caravan/boat or camper easier than ever! It takes just SECONDS and prevents those awkward ‘oh damn’ moments! Reversing cameras are great but they do not stop accidents as efficiently as this trailer guide. Our budget guide is located here. Chris Lilley: Best investment we made….One of us would have done jail time otherwise. Tony McKenzie: One of the best things you will ever buy! Hank: My Prado has a reversing camera, not a very good one though, which I use when hooking up. I also bought a marriage saver (Couplemate), a bit old hat but it works. It is too easy to reverse back that little bit too much and ding your rear bumper, the couplemate stops that. Yes, I thought so too, Ted Bullpit is not a great driver, is he? Reversing cameras are great, but they will not stop you accidentally hitting the caravan coupling. Our reversing guide helps prevent damage. Even America thinks the Aussie Marriage Saver is a must-have addition for their caravans. NOTE: Fits all highway electric and non-electric couplings but not off-road couplings. We have a different model for off-road couplings. Lock you coupling when travelling to help prevent accidental uncoupling. Moving over rough ground has been known to cause your trailer coupling to become dislodged from the tow ball. The Couplemate Trailer guide when used vertically helps stop decoupling. A padlock is required to be purchased to lock the wing into position. Feedback 25/09/2013: The Couplemate Marriage Saver® is certainly the ‘bees knees’ it’s so easy to use, and it stops all our arguments, I do not know how I ever managed before getting this beaut performer. Whoever named this product sure knew what he (or she?) was talking about. I never realised how inept I was until I started directing my husband when hooking up our caravan. Then thank goodness along came the Couplemate Marriage Saver®. Year 34 coming up soon and I know we will make it! The Couplemate® Marriage Saver is an innovative self-aligning trailer accessory designed to locate your trailer coupling directly over the tow ball without assistance, physical effort or guiding. Just wind down the jockey wheel. 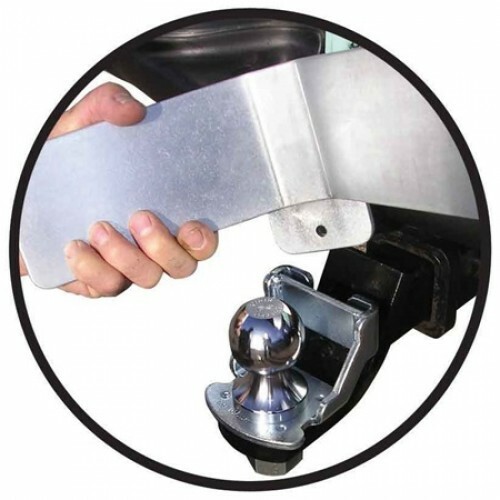 The Caravan reversing guide provides a way to prevent damage to your vehicle during hitch-ups. No more heavy lifting during hitch-ups. Removable wing when not in use. Avoids damage to the back of your vehicle. Saves time and effort on every hookup. Avoids arguments with your co-driver. Self-aligns your trailer directly over your tow ball. Couplemate® is backed by an unconditional lifetime guarantee when used by manufacturers recommendations. PATENTS USA 5,697,630; CANADA 2 157292; AUSTRALIA 673536. TIP 1: To ensure correct height during hookup count the number of links on the ground from your safety chain when unhitching trailer. When camping or during extended stays it is likely the trailer or camper wheels will sink slightly and children may adjust the setting of your jack stand/jockey wheel. When hitching up, count the links on the ground again and adjust the height to the original position. TIP 2: During hitch up back your vehicle approximately 3′ from the coupling head. Exit the vehicle and inspect that the wing is in proximity to engage the trailer coupling head. Reverse until you feel Couplemate centre the trailer, then reverse and look in the mirror to see the trailer move approximate 1′. This procedure ensures your trailer is out of the wheel ruts and will quickly move backwards or forwards when you wind down the jack wheel. This process helps eliminate the tongue of the trailer coupling from becoming stuck on top of the tow ball and ensures a correct hookup. Couplemate Marriage Saver® is very well priced and that makes it the best selling and most efficient Trailer Guide on the market today. Check out our fantastic prices; you won’t buy better! IMPORTANT: If you are like me, the thought of the trailer jumping of the tow ball is scary. Worn tow balls or trailer couplings are tough to detect, so it is comforting to know the Couple-Mate® caravan reversing guide will aid in the prevention of your trailer coupling jumping off the tow ball on those rough roads. Editors Review: The Marriage Saver was one of our first products and continues to be one of the best sellers. Of course, it gets 5 Stars. If you have a story or review, we would certainly like to hear from you. thank you so much for your wonderful and generous service. Indeed our Couple Mate arrived today, just in time for us to safely travel with the benefits it provides. We are truly delighted to have received our order so quickly, which solved our dilema, and we wish you all the best with your business.